England's Euro 2020 qualifying campaign got off to a flying start as a Raheem Sterling hat-trick inspired Gareth Southgate's side to an emphatic 5-0 victory at Wembley. After Harry Kane also got in on the rout on Friday, here is a look at England's biggest wins at Wembley Stadium to date. England proved that they could deliver the goods in emphatic style when the stakes were high with a 5-0 win over Malta at Wembley in a European Championship qualifying group match in May 1971. A brace from Martin Chivers set the tone, and further strikes from Francis Lee, Chris Lawler and an Allan Clarke penalty sealed a resounding win in London. England eased to a 5-0 victory over Cyprus in a European Championship qualifying group match in April 1975, in a match best remembered for the remarkable performance from Malcolm Macdonald. The forward scored all five goals in a brilliant individual showing to seal a big win at Wembley for the home side. England eased to a comfortable 5-0 win over Luxembourg in March 1977 courtesy of strikes from Kevin Keegan, Trevor Francis, Ray Kennedy and a brace from Mick Channon to give the home side victory in a World Cup qualifying group game at Wembley. England recorded a 5-0 triumph over Finland in the 1986 World Cup qualification group stage at Wembley in October 1984. Goals from Tony Woodcock, Bryan Robson, Kenny Sansom and a brace from Mark Hateley sealed the emphatic victory. A Gary Lineker hat-trick inspired England to a 5-0 victory over Turkey in a 1986 World Cup qualifying group phase clash in October 1985. Additional strikes from Chris Waddle and Bryan Robson sealed a comfortable victory for the home side at Wembley. England eased to victory with a commanding 5-0 victory over Albania in a 1990 World Cup qualifying group clash in April 1989. Strikes from Gary Lineker, Chris Waddle, Paul Gascoigne and a brace from Peter Beardsley sealed a strong victory for the home side at Wembley. England recorded a comfortable 5-0 victory over Greece in a friendly clash at Wembley in May 1994. A brace from David Platt and further strikes from Darren Anderton, Peter Beardsley and Alan Shearer sealed the victory. One which was never likely to prove difficult in terms of the opposition but which was an impressive victory all the same, the Three Lions recorded a convincing 5-0 win over San Marino in a 2014 World Cup qualifying group phase match in October 2012. A brace apiece from Wayne Rooney and Danny Welbeck and an Alex Oxlade-Chamberlain strike sealed victory at Wembley for England. Two years on, England repeated the trick with a repeat result against the same opposition at Wembley, this time in a Euro 2016 qualifying group stage match in October 2014. Goals from Phil Jagielka, Wayne Rooney, Danny Welbeck, Andros Townsend and an own goal led the Three Lions to victory on that occasion. In England's latest Wembley goal-fest, the Three Lions put five past Czech Republic in the opening game of their Euro 2020 qualifying group campaign. ​Raheem Sterling stole the show with a stunning hat-trick, whilst ​Harry Kane also got in on the scoring act before a late own goal put the game to bed at Wembley. An Alan Shearer hat-trick inspired England to a 6-0 thrashing of Luxembourg in a Euro 2000 qualifying group phase clash in September 1999. Steve McManaman also hit a brace before Michael Owen struck late on at Wembley. 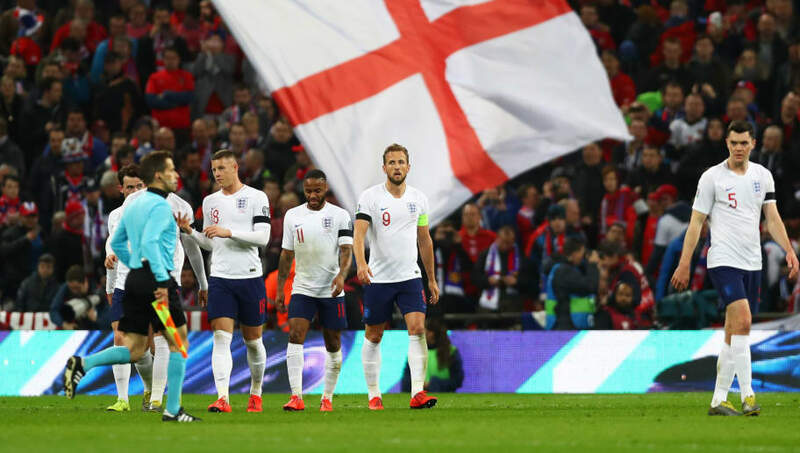 The Home Championship did not always provide England with the results they were looking for, but it did provide the platform for the Three Lions to record some emphatic scorelines at Wembley. An 8-3 victory over Northern Ireland in November 1963 was another memorable occasion in London, as Jimmy Greaves struck four goals to steal the show. Terry Paine bagged a hat-trick, whilst Bobby Smith also struck. A four-goal haul from David Platt stole the show as England eased to a resounding 6-0 victory over San Marino in February 1993. Further goals from Carlton Palmer and Les Ferdinand capped an emphatic day's work in a 1994 World Cup qualifying group stage clash at Wembley. ​Wayne Rooney and Jermain Defoe scored a brace apiece as England dismantled Andorra with a 6-0 victory in a 2010 World Cup qualifying group stage match in June 2009. Frank Lampard and Peter Crouch were also among the goals as the Three Lions eased to victory at Wembley. In an incredible 12-goal encounter, England emerged victorious by a six-goal margin when they overcame Scotland in an extraordinary 9-3 victory in the Home Championship in April 1961. Jimmy Greaves led the way of legendary goalscorers at Wembley that day, scoring a hat-trick which was added to by further strikes from Bobby Robson, Bryan Douglas, Bobby Smith and a brace from Johnny Haynes. England delivered a thrillingly relentless attacking display at Wembley in September 1973 when the Three Lions dispatched Austria with a 7-0 thrashing. A brace apiece from Mick Channon and Allan Clarke were added to by further strikes from Martin Chivers, Tony Currie and Colin Bell to give the home side an emphatic victory. England certainly found their scoring touch with aplomb during the emphatic win over Scotland, and the Three Lions recorded an even more complete performance with an 8-0 victory over Mexico in an international friendly less than a month later. A Bobby Charlton hat-trick capped the occasion at Wembley in fine style, whilst Bobby Robson, Gerry Hitchens and Ron Flowers also got in the act, and Bryan Douglas scored a brace. Two years on from a 5-0 victory over the same opposition, England went three goals better with an 8-0 thrashing of Turkey in a Euro 1988 qualifying group clash at Wembley. A Gary Lineker hat-trick was added to by a brace from John Barnes and further strikes from Bryan Robson, Peter Beardsley and Neil Webb to complete an attacking masterclass from the Three Lions. In England's biggest win at Wembley to date, a Luther Blissett hat-trick capped off a ruthless attacking display in which the home side battered Luxembourg with a 9-0 win. Further strikes from Steve Coppell, Tony Woodcock, Mark Chamberlain, Glenn Hoddle, Phil Neal and an own goal sealed an historic victory for the Three Lions in the Euro 1984 qualifying group phase.